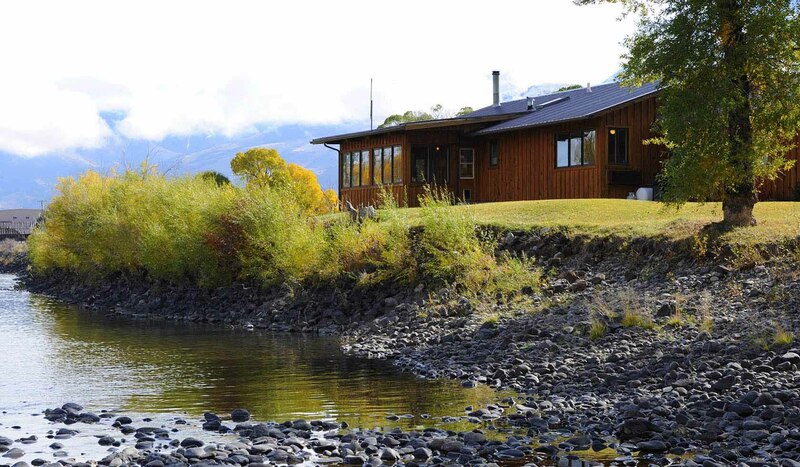 Great getaway on the banks of the Yellowstone River; just a short drive from Yellowstone Park! Bring your drift boat because there's a place to launch right out back! Fish out the back door, hike and bike in the rugged Absaroka Mountains, drive into Livingston for some small town, western entertainment. Fabulous dining and soaking at nearby Chico Hot Springs. This home has high speed Internet and is one of our few properties with air conditioning. Brief Description: This western style ranch home enjoys a beautiful location on the Yellowstone River South of Livingston. General location: Located in the center of the Paradise Valley, about 25 minutes south of Livingston, and just 25 minutes North of Yellowstone Park. Bozeman is an hour away. Bedrooms: The home has three bedrooms, all decorated very tastefully, with a western theme. The master bedroom has a king size bed and a large private bath. The second bedroom has a queen size bed. The third has two twin beds. There is a second full bath in the house just off the living area. For additional sleeping options, there is a day bed on the front porch. River Rose can accommodate up to seven guests. Kitchen: The large, open kitchen has a gas range and oven, a dishwasher and a microwave. There is lots of counter space, including a counter island area with bar stools for folks to sit and chat with the cook. The kitchen is fully equipped with everything you'll need as far as cookware and serving ware and there is a spice cabinet with all the basics. Dining room: The dining room table seats six comfortably. There is also seating for four at the kitchen bar counter and a table that seats 6 in the sun porch. Living room: The comfortable living room has a wood stove to warm up near on those chilly evenings, A/C for those hot afternoons and lots of couches and chairs to sit and relax and a flat screen television and DVD with satellite service. There is a small portable stereo that will play cd's and tapes and also an Ipod docking station. Setting, acreage, views: River Rose is located on a small ranch in the Paradise Valley. As you enter the property, the long driveway weaves between irrigated green horse pastures until you reach the River Rose home, situated right on the banks of the Yellowstone River. A large grassy lawn area out front is perfect for kids to play and to enjoy the fantastic views of the Absaroka Mountains. There is a property caretaker that looks after the owners' horses, as well as the River Rose home. The caretaker's residence is far enough away that your privacy is ensured, yet he can be easily reached if there is a need. Out in back of the home, the river flows by just feet from the back door. A large grove of cottonwood trees provides some nice shady areas for picnics on those sunny days. Outdoor amenities: There is plenty of outdoor seating for barbecues, as well as a gas grill. Enjoy the views and the river frontage provided at River Rose! A natural boat launch allows you to start or end your float trip right at the house. Activities nearby: Fishing, hiking, rafting, horseback riding, visiting Yellowstone Park and just relaxing and getting away from it all! For an especially memorable experience in the park, book a specialized private tour with our sister company, Greater Yellowstone Guides. Chico Hot Springs, a charming, historic establishment, is just ten minutes away - with fine & casual dining, hot spring fed pools for soaking and even live music. The towns of Livingston and Gardiner are both about 25-30 minutes away with shopping, galleries, restaurants, etc. The town of Bozeman and Gallatin Field Airport are just over an hour away.